The 7th Annual SASS Convention and Wild West Christmas returns to the Riviera Hotel and Convention Center in Las Vegas, December 4-7, 2008. Presented by the Single Action Shooting Society and its 80,000 members. The SASS Convention brings together all that is Old West Cowboy and is presented to showcase the products, events and related industries pertaining to this icon of American Western Culture. In addition to more than 100 exhibitors the convention will provide an extended schedule of daily educational seminars, guest speakers and entertainment. Seminars will be conducted by experts in the various areas of the sport as well as authors of the many books on Cowboy Action Shooting. Cowboy entertainment will be interspersed to provide a non-stop activity program for SASS members and the public alike. For SASS members the social calendar of the SASS Convention will include a steady series of receptions and special events. SASS members are invited to gather each evening for cocktails and hors-d’oeuvres in the SASS Hospitality Sky Box. The private reception rooms overlook the convention floor and provide a perfect place for members to mingle after the convention closes for the evening. On Thursday, Conventioneers and their guests can gather at the Top of The Riv for the Classic Cowboy Saloon Dance. The event includes the annual Classic Cowboy/B-Western Costume contest. A special luncheon on Friday will honor the 2008 SASS Hall of Fame inductees. Later that evening guests will be treated to “An Evening with.” SASS’ annual presentation where guests are invited to learn about important industry leaders first hand in an intimate and candid setting. Highlighting the four-day convention is the SASS Yesteryear Ball. The formal SASS Social event of the year whose theme this year is Nations Centennial will begin on Saturday evening at “Top of The Riv,” and continue in the Grande Ball Room for a prestigious evening of dinner and dancing accompanied by an authentic Victorian orchestra. The SASS Convention and Wild West Christmas is open to the public and coincides with PRCA National Finals Rodeo. Also taking place simultaneously are the enormous Cowboy Christmas and Country Christmas shopping shows at the Las Vegas Convention Center and Sands Convention Center. 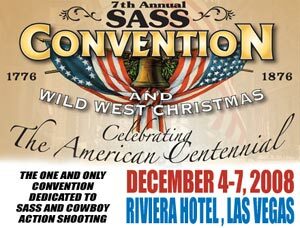 The 7th Annual SASS Convention and Wild West Christmas is produced by the Single Action Shooting Society, better known as SASS. General admission to the public is free. A special room rate is offered by the Riviera by calling 1-800-634-6753 and mentioning SASS. SASS Convention registration applications will be available on line by August 1st at www.sassnet.com or by calling the SASS office at 1-877-411-SASS.